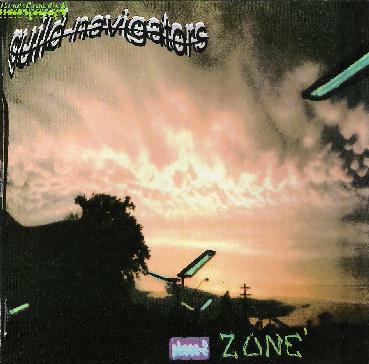 Guild Navigators - "Phase 2=Zine EP"
Guild Navigators - "Phase 2=Zone EP"
Crushing space punk from Athens, Ohio, Phase 2=Zone is a four-song EP that busts through the asteroid belt on its way to Jupiter and beyond. Mixing equal parts Chrome and Hawkwind with elements of Farflung and Pressurehed, Guild Navigators function as a transom through which all things cosmic fly and converge. The overall sonic atmosphere of Phase 2=Zone is much like that of the early Chrome sound (Alien Soundtracks and Half-Machine Lip Moves, in particular): twisted vocals, industrialized drums, droning synthesizers, pulsing bass and screeching feedback guitars. It's as if The Stooges had recorded Raw Power in a starship headed for the heart of Cygnus X-1. "Falling Towards the Sun" is a malevolent rocker that smashes its way to a rendezvous with solar oblivion; the massive crash of drums and the blitzkrieg stun of Freak Spaceley's guitar is relentless. "Glimmer" and "The Cryogenic" are even more intense, a kind of cosmic speed metal that pushes the space warp well beyond light speed. "Dy Maxion," however, is the signature track of Phase 2=Zone. Cruising through deep space like a rocket on a suicide mission, "Dy Maxion" burns up the interstellar speedway with the fiery squeal of fuzz-wah guitar and a nuclear fueled rhythm section. Clearly, a full-length Guild Navigators album sometime in the near future would be much anticipated. But in the meantime, fans of early Chrome will revel not only in the meltdown-the-VU-meter studio attack of Guild Navigators but will also appreciate the no frills packaging that befits the group's street tech approach to 21st century space rock. Just make sure you don't implode your speakers while listening to Phase 2=Zone. For more information you can visit the Guild Navigators web site at: http://www.geocities.com/guild_navigators.